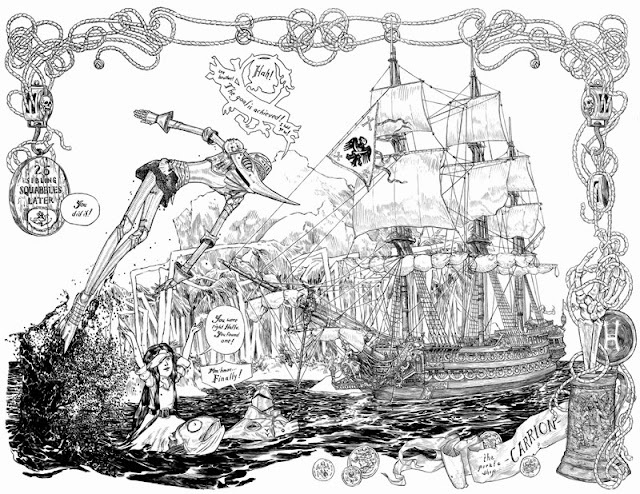 thebackingboardfiles: Cursed Pirate Girl is comic book treasure! Avast ye! Cursed Pirate Girl is like discovering literary treasure. 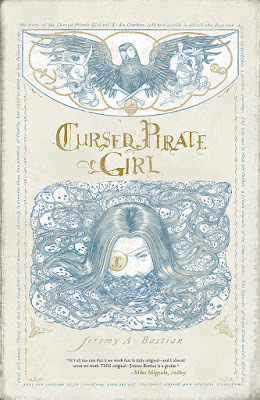 Written and drawn by Jeremy Bastian, Cursed Pirate Girl is about a young girl’s quest to find her father who is a dreaded buccaneer in the mythical and mystical waters of the Omerta Seas. Cursed Pirate Girl is accompanied by the parrot, Pepper Dice, and the Swordfish Brothers, in their incredible voyage of discovery. 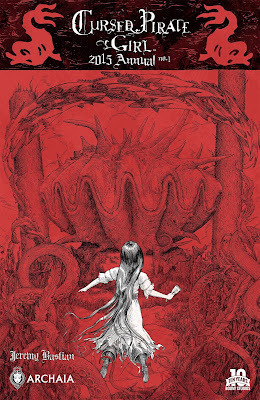 The story will bring to mind a nautical madcap version of Alice in Wonderland and will elicit a smile for those weaned on Mother Goose, the art of Arthur Rackham and Charles Vess, and the startling imagination of Neil Gaiman. It’s a high fantasy story on the high seas! There are two things that will strike you when you turn each page of Cursed Pirate Girl. First is the intricate and amazingly detailed black and white art that harkens back to a bygone age of illustrated fairy tales and nursery rhymes as well as adventure books by Jules Verne, HG Wells, and the like. Even with today’s comic book scene having no particular dominant art style, Bastian’s art will stand out as there is no one else illustrating comic book panels like him. And for all the “old style” it is a refreshing change. I can only imagine the long hours, days, and months for each comic book to be done. No wonder that the first three issues were released bi-monthly and independently by Olympian Publishing in 2009 with the latest, Cursed Pirate Girl Annual #1, that is Chapter IV, published six years after in October 2015! That the four chapters are drawn over a period of time is also fascinating as you can clearly see the refinement of Bastian’s craft especially in the annual where it is more polished with the line work more defined. And that leads me to the second that is the succulent writing. The appeal of pirate lore lies in the adventures of which one can add the adjectives “swashbuckling” or “grand” or untold treasures when in truth, these plunderers of the high seas were terrifying and murderous men. Make no mistake, the world or the seas of Cursed Pirate Girl are deadly and violent. She actually pays for crossing the Governor of Jamaica by losing an eye. I love that fact that I cannot tell where the story is going with its twists and turns. Sure Cursed Pirate Girl is going from ship to pirate ship to find her father. However, along the way, it is journey to the increasingly weird. Bastian’s prose never bores you. He is never verbose. There are morsels of conversation and interjection and lengthy monologues but you hang on every word as you want to understand and to get to know this zany if not frightening world of pirates, mythical creatures, monsters, and vengeful men. In fact, it’s hard to believe that Cursed Pirate Girl is a 21st Century creation and not something that was published in the 1800s! Right now, the original three issues have been re-collected into three trade paperbacks through the years with the most recent just a few months ago. After the original collection by Olympian Publishing, Archaia Studios Press printed the next two editions. 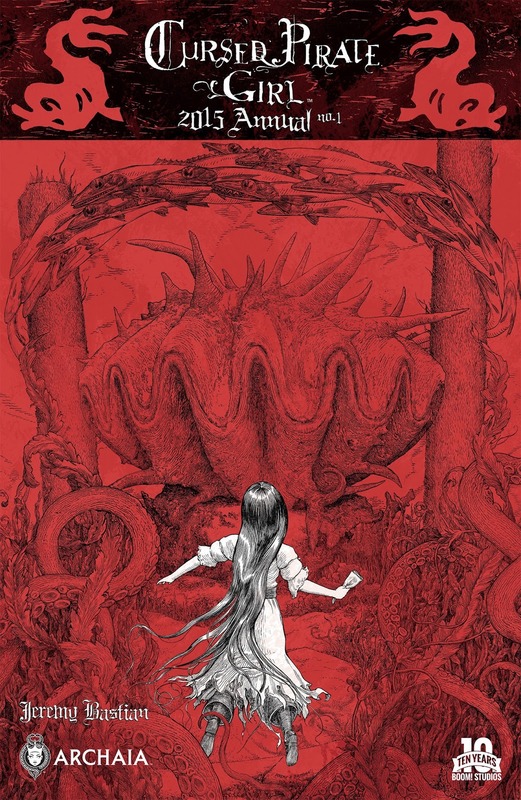 Since Archaia was purchased by Boom Studios in 2013, the annual is now under the joint imprint of Boom and Archaia. And that means Jeremy Bastian’s modern-day masterpiece is available for all to read, love, and appreciate just as we did those nursery rhymes and fairy tales of our childhood. Now walk the plank and check out Cursed Pirate Girl, mateys! 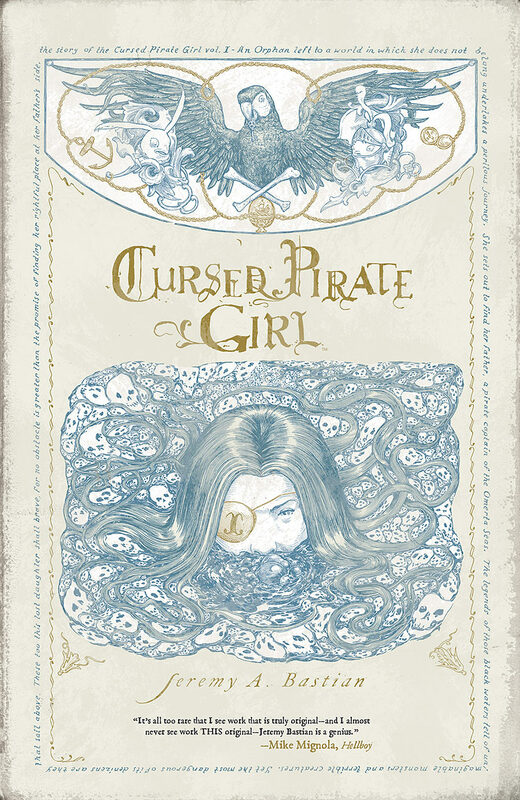 Cursed Pirate Girl is available for order at Comic Odyssey or FullyBooked branches in Manila.